We honestly did not know what to expect at Picholine. I essentially picked this restaurant based on one dish—the sea urchin panna cotta. Picholine is more formal than we expected—definitely formal service. The crowd was definitely not young and hip, so we were right at home. We devised our own tasting menu with help from a very good server, Glenn. We split most courses except for the sea urchin. 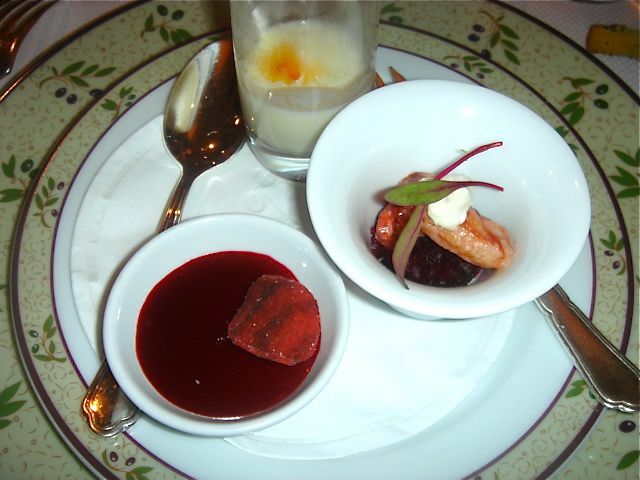 Amuse: Goat cheese panna cotta topped with beet gelee, warm cauliflower veloute with chipolte oil and smoked lobster with beet tartare and crème fraiche. 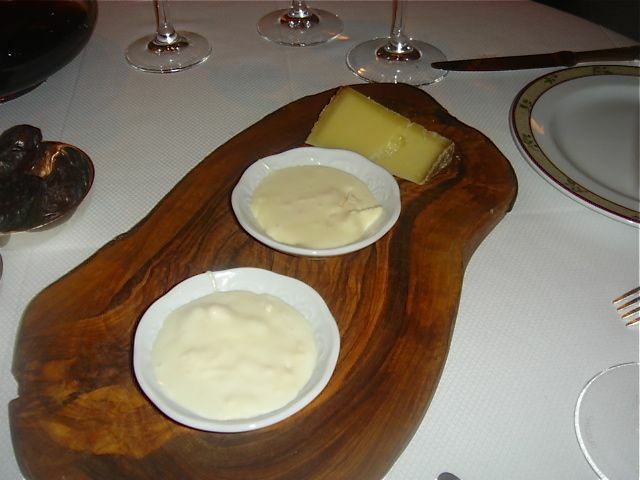 A nice beginning with the nod going to the panna cotta and the cauliflower “soup”. 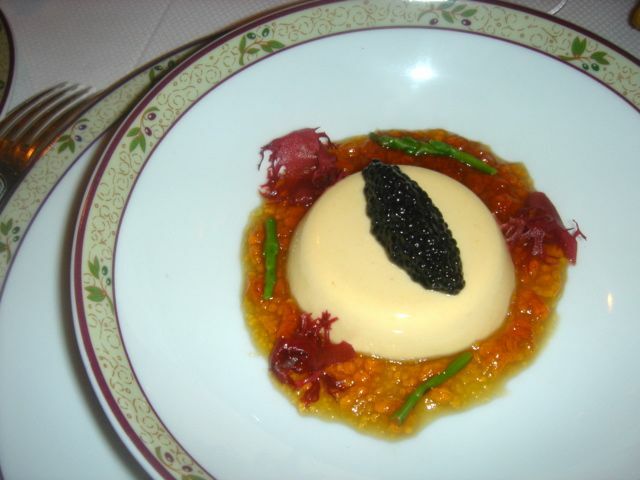 1st course: Sea Urchin Panna Cotta with chilled aspic of lobster stock consommé, topped with Oscetra caviar. This was served with a potato crisp that was tasteless and unnecessary. 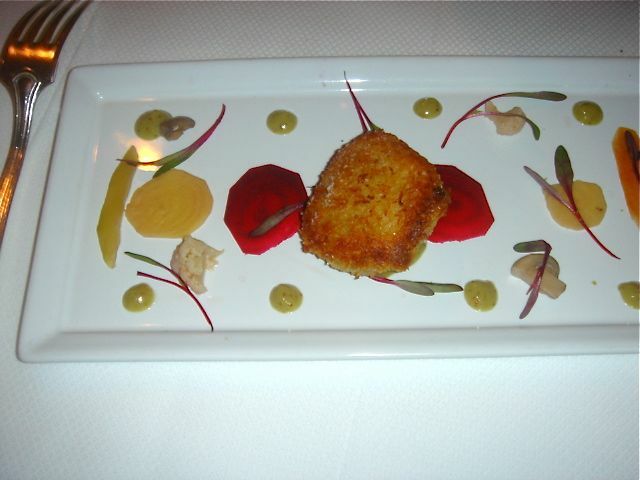 The dish itself was delicious and definitely worthy of being called a signature dish. [a] Tuna Cru “Napolean” with some sort of “rice crisp” and olive oil ice cream. This just did not work. The tuna was not as good as we get at our local Japanese market and the ice cream was “odd”. 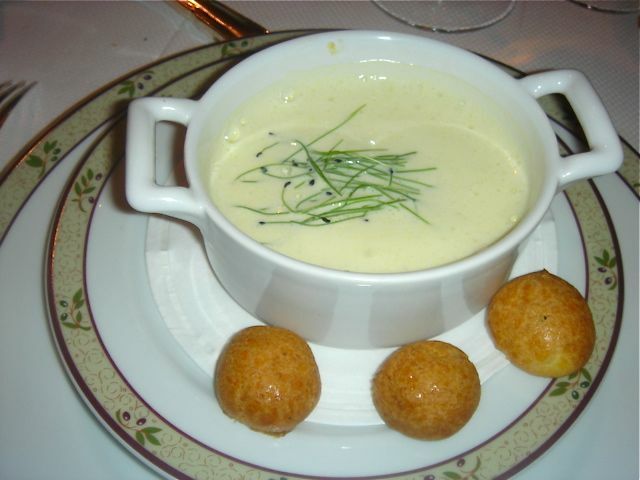 [b] eggs en cocotte with gruyere cheese—John had immediate visions of me making this at home—delicious!! 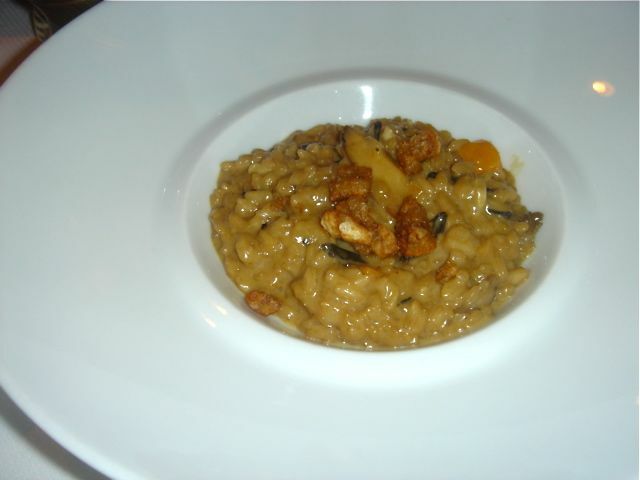 3rd course: risotto with squash, crispy duck and black truffle butter, served family style [later dishes were split in the kitchen]. The exceptional component in this dish was the duck which added great texture and taste to the risotto. 4th course: Crisp sweetbreads with pickled crudite and a raisin mustard emulsion. Excellent. 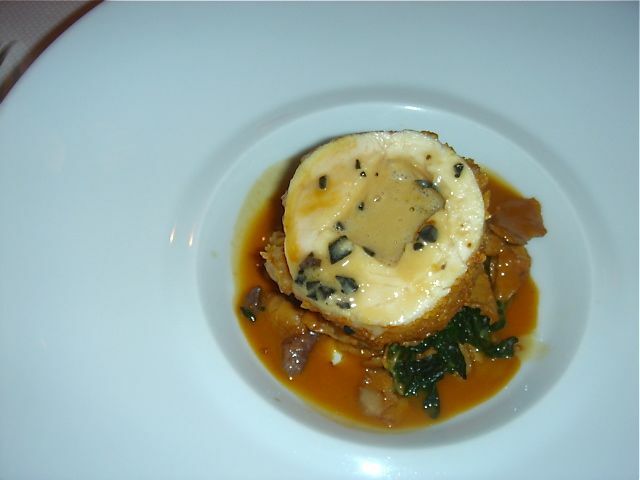 5th course: Chicken “Kiev”, chanterelles and liquid foie gras— I was full at this point. John loved it. 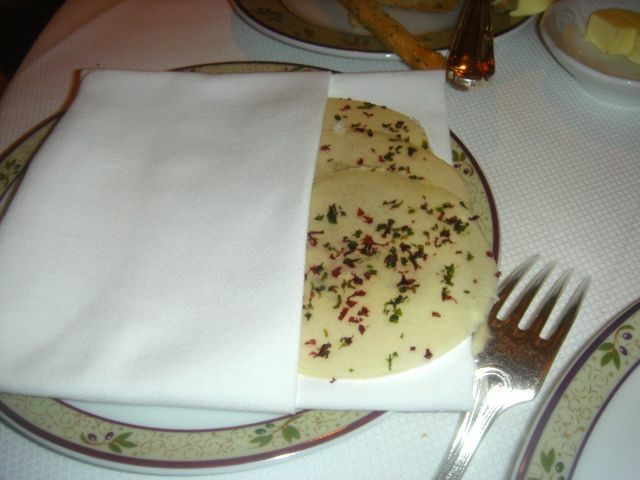 Picholine’s food is not for the faint of heart. It is very very rich. 6th course: Cheese—Holzige Geiss, a goat milk cheese from Switzerland, Alp Drackloch cows milk cheese from Switzerland and a Vacheron Mandome, cows milk from Switzerland. The first and third were not on the card as they are “illegal” unpasteurized and should not get to the USA, but they do and they were delicious. Tattinger Rose $ 24.00 per glass…nice but not really worth that much. “Sanclodio” Rebiero, 2005 Spain—delicious, full bodied white that worked very well with the food all the way up to the risotto. Remelluri, 2002, Rijoa—excellent, bright, fruity, and deep. Both Spanish wines worked very well with the food. The sommelier was pleasant, informed and helpful. Our waiter, Glenn, a fairly recent graduate of the University of Wisconsin, was bright, very pleasant, and enthusiastic about helping us. 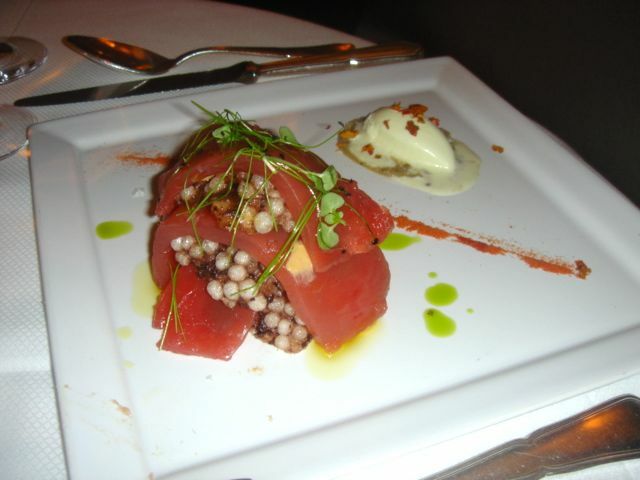 Over-all an excellent experience with very good food. The pricing was fair. We jumped around, did splits and asked for lots of extra services yet the check was only $ 200 for our food. Their more expensive “chose any 4 dishes” menu is $ 95.00 each so for $ 10.00 more we got everything we wanted the way we wanted it. One of the managers, a French guy spent some time visiting and everyone else was very cordial. Definitely worth going back for a very good dining experience.